They say games like rummy are purely luck based and no amount of skill set is required to play and win it. Well, if we put our factual opinion here, not really. Rummy is a skill based game where lots of mathematical calculations and mind reading is involved. In other words, we can say that Rummy and mathematics are just two sides of the same coin. A lot of skills are required to become a professional in this game. So, rummy can be called more of mind game, rather than a game of just drawing and discarding cards. When certain things are made clear by the highest authority in the interpretation of the law in India, i.e. the honorable Supreme Court, no further question remains to be asked post that. In one of its judgment the Supreme Court has said that the game of rummy involves skill and it is NOT a game of sheer luck, rather it is a game of skill that requires superior knowledge, training, attention, experience and adroitness of the player. As card games go, rummy is a game of luck at the beginning of the game when the cards dealt at the opening are randomly shuffled. 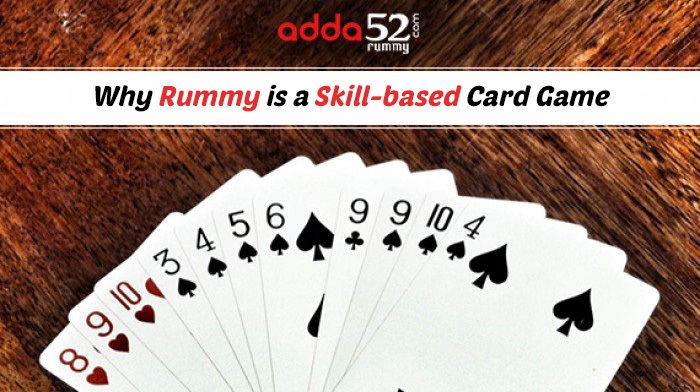 From that moment onwards, rummy becomes skill-based because the game requires you to take decisions. Unlike some other card games that are centered purely on luck, rummy allows you to tilt the game in your favor by exercising your brainpower. Today, rummy and Indian youth have collaborated together to discover a new earning source, that too in a very legal manner. When we say legal, we mean to say that games that are based on skills have been excluded from the most gambling acts. Being a game of skill, Rummy does not come under betting or gambling and it is legal to play. It is a skill based game where players show their real-time skills at the table by arranging the 13 cards in the valid sequences or sets. That is the reason youngsters have seen a lot of potential in Rummy and see it as a game that is beyond just sheer luck. The games where the outcome depends upon the substantial degree of skills cannot be considered as a mere luck based game. And since Rummy is a game that involves the skills of the person playing the game, it has been considered and categorized as a legal game that can be played without any fear. It’s a game that specifically focuses only on skills rather than chances. As we all know that the game of Rummy is normally played by two to six players and the Indian version of Rummy is a card game that is based on systematic expertise and consistent capacity than just luck. Indian Rummy is based on matching the cards of the same sequences or units. It is the only card game that is based more on analytical skills and logical ability than on luck or chance. In order to win in the game of rummy, it is necessary to have one most useful skill (besides your strategy, of course), which is, a great memory and concentration. Memory is one of the most important skills to possess. An essential skill in any card game is memorizing which cards have appeared and which cards are held by your opponents or remain in the deck. This ability to remember which cards have been picked up and discarded will help you decipher exactly what your opponent is trying to formulate in his or her hand, so that you can make good drawing and discard choices to form melds.